WITH CANADA’S LIBERAL GOVERNMENT, THE GOLF INDUSTRY FACES A LOOMING SHIPWRECK OF ANNIHILATION ! ― AND CGSA IS DOING NOTHING BUT HANDING OUT POINTLESS AWARDS ! Who Cares About The Equipment Technician Of The Year ?!?! Why Is Canadian Golf Superintendents Trade Association ( CGSA ) Wasting Its Time When More Serious Issues Need To Be Addressed ?!?! Health Canada Has Proposed Or Has Enacted National-Prohibitions Against The Golf Industry’s Desperately-Needed Pest Control Products ! CGSA Must Stop The Liberal’s National-Prohibitions, Forever ! PROHIBITION & APOCALYPTIC CARNAGE ― It is a fact that prohibition against pest control product leads to carnage in the form of business destruction and business failures. ( See links below. ) And now, Canada’s Liberal Government plans to inflict this apocalyptic carnage against the golf industry. And CGSA is doing nothing ! LIBERAL CONSPIRACY AGAINST THE GOLF INDUSTRY ― As expected, once elected to power, Canada’s Liberal Government quickly conspired to impose national-prohibitions against the golf industry’s pest control products. The proposed and enacted national-prohibitions against the golf industry’s desperately-needed pest control products, like carbaryl, chlorothalonil, iprodione, and neonicotinoids, come as NO surprise since the decisions by Health Canada are being implemented within mere months after Liberal Party won in the Canadian General Election on October 19th, 2015. Observers expect that Canada’s Liberal Government will eventually annihilate the golf industry, and its businesses, its assets, and its customers. And CGSA is doing nothing ! LIBERAL PROHIBITIONS AGAINST THE GOLF INDUSTRY ― So far, the golf industry has been jeopardized by national-prohibitions against NOT only neonicotinoid insecticides, but also carbaryl, chlorothalonil, iprodione, and quintozene. The vast majority of these prohibitions were imposed by Canada’s Liberal Government since 2015 ! For almost a decade, observers have warned trade associations, like CGSA, that they should NOT feel too smug about its pesticide ban exception status. Since 1991, the golf industry has avoided any national-prohibition because it had been provided with a pesticide ban exception status ― thankfully, Mr William H Gathercole crafted the original golf industry’s exception status in the town of Hudson, Quebec, which has endured to this day for virtually all jurisdictions in North America. 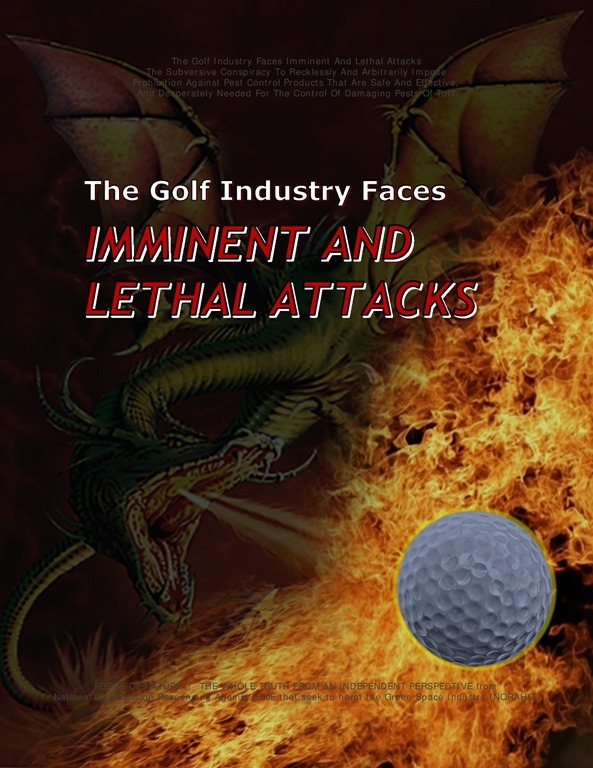 With the Liberal Party of Canada now in power, observers have been forced to continue to repeat their warning to CGSA ― anti-pesticide terrorism will never, ever, end until the golf industry has lost all of its conventional pest control products. Why ?!?! Because Liberal Party of Canada despicably operates as the political shield for anti-pesticide & environmental-terrorist organizations, like World Wildlife Federation Canada ( WWF ). Since 2015, observers have also warned CGSA that, if successfully elected to power, Liberal Party of Canada would conspire to impose national-prohibition against all conventional pest control products. ( See links below. ) Anti-pesticide & environmental-terrorist organizations have already inflicted horrendous and catastrophic carnage, as well as terror, despair, and destitution, against thousands of hapless victims throughout the professional lawn care industry. ( See link below. ) And now, golf is next ! And CGSA is doing nothing ! LIBERAL PROHIBITIONS WILL ANNIHILATE THE GOLF INDUSTRY ― With national-prohibition against the golf industry, pest problems will become increasingly unmanageable without effective & safe conventional pest control products, playing conditions will be destroyed, and golf facilities will be annihilated ! With national-prohibition, the owners, employees, and families dependent on safe and effective pest control products will face terror, despair, and destitution. Under Canada’s Liberal Government, people dependent upon work at golf facilities will suffer losses to their employment, lifestyles, job security, families, children, loved-ones, and futures. And CGSA is doing nothing ! 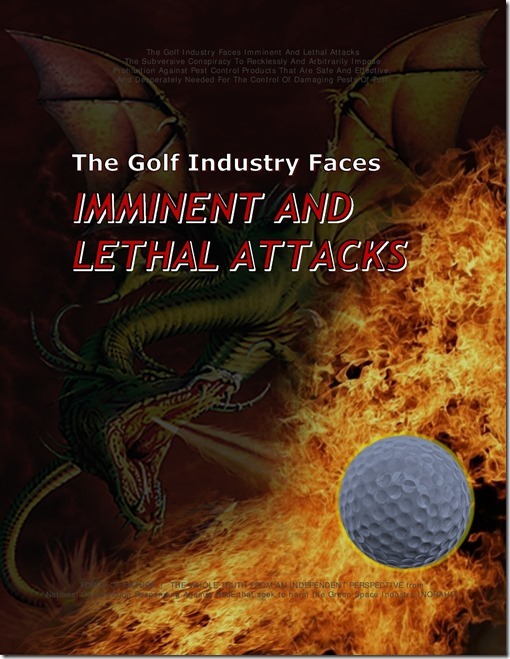 THE FAILURES OF CGSA ― And it becomes increasingly obvious that the golf industry’s trade associations, like CGSA, have failed their members since they appear unable or unwilling to adequately defend these products. They have exhibited depraved indifference towards their member-superintendents and their golf facilities. Future generations will ask the question ― why did CGSA do nothing ?!?! THE CRITICAL ISSUES ― The golf industry must strongly adopt the position that conventional pest control products are scientifically-safe and will cause no harm. The golf industry must also adopt the policy that the only course of action against prohibition is through litigation. The golf industry must plan for the inevitable and total revocation of its exception status in most jurisdictions across Canada. The golf industry must terminate all relationships with all pesticide-hating & environmental organizations that conspire to prohibit against conventional pest control products, like Canadian Cancer Society, ( a.k.a. Prevent Cancer Now ), World Wildlife Fund ( a.k.a. Liberal Party of Canada ), and others. As long as Golf Canada, and the entire golf industry, continue to provide money to Canadian Cancer Society, the golf industry is under threat of being annihilated ! The golf industry must openly and financially support all conservative political candidates who oppose any prohibition of pest control products and fertilizers. Whenever successfully elected to power, Liberals and New Democrats will always conspire to impose arbitrary prohibition against all pest control products. WE SPEAK THE WHOLE TRUTH ABOUT CGSA, FROM AN INDEPENDENT PERSPECTIVE !